Heading up from the shops to the Inn at Pleasant Beach. The shops at Pleasant Beach Village. I recently had the pleasure of staying at The Inn at Pleasant Beach on Bainbridge Island. Aside from a great location and a very comfortable and stylish stay, I absolutely loved the landscape around the hotel and shops! Everything was so much nicer than it needed to be, giving the sense that the buildings were truly situated within a garden. Even the parking lots were integrated into the larger scheme. Plants, water, sculpture, framed views- so many details were considered. A huge thank you to the many people who designed, installed, and continue to maintain this beautiful destination! I had a wonderful trip to Far Reaches Farm in Port Townsend, Washington, yesterday. My mother, aka The Plant Collector, goes there on a regular basis, and we finally got to go together. If Port Townsend is in reach for you, go for a visit ASAP! The demonstration gardens were wonderful, particularly the greenhouse, which felt like a trip into the Rain Forest with towering lilies and enormous foliage in every direction. If you don’t live locally, you’re still in luck, because they have a very popular mail order business. As for me, I had 2 takeaways: 1) I must track down some Melica uniflora f. albida as soon as I get home; and 2) When visiting, always plan to have lunch up the road at the Spruce Goose Cafe at the Jefferson County International Airport! Inspiration is everywhere! I alway enjoy looking around my client’s neighborhoods to see what people are doing with their gardens. This neighbor made clever use of a sliding door to create a movable wall at the end of their front porch. What a great way to create privacy without completely blocking access to the side yard. I’ll definitely keep this idea in my back pocket! Not sure what to plant? Look around! Ferns, Pulmonaria, Hellebores, Redbud, Astilbe and more grow at the driveway’s edge of this woodland garden. Whenever I go for a site visit, I like to look around the neighborhood to see what’s growing. This gives me a sense of the area and also helps me identify plants that might thrive, especially with regard to deer. This lovely garden is at the edge of a long driveway on a very wooded lot. I was surprised to see the host looking so good, but you never know what route deer will take as they pass through. Maybe the proximity of the hellebores acts as a deterrent? I don’t know, but I enjoyed seeing it. 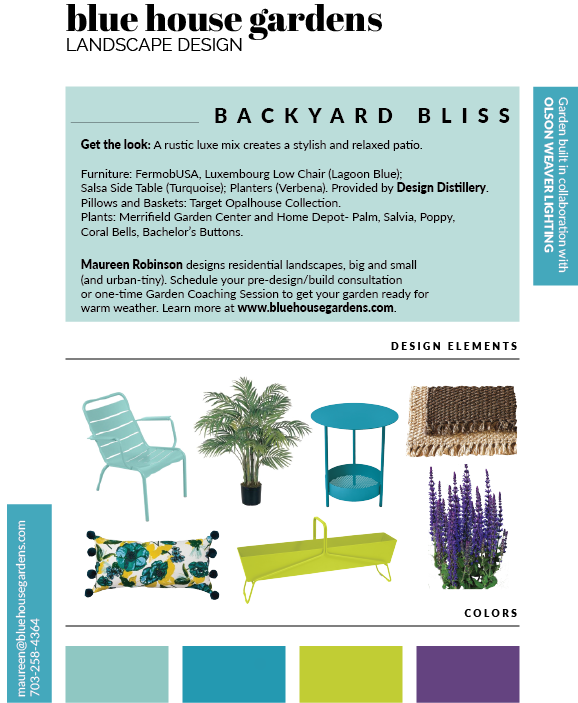 Fermob Furniture makes the garden! We’re ready for the 2018 Arlington Home Show & Garden Expo. I hope you can stop by to chat with me and Olson-Weaver Lighting about ways we can help you create a beautiful outdoor space!